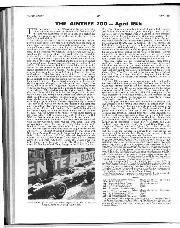 This year's Aintree 200 race differed from last year's in being increased in distance from 200 kilometres to 200 miles, and the field was augmented by the inclusion of a section for Formula Two cars, as used to be the case in the days of the 2½-litre F.1 and 1½-litre F.2. For a change Aintree was bathed in sunshine on race day and despite a brisk breeze a reputed 50,000 crowd filled the stands to watch some interesting and occasionally exciting racing. After two preliminary races in the morning and a further one after lunch, the F.1/F.2 cars came out onto the circuit for their 67-lap race. In pole position was Graham Hill in a brand-new B.R.M. based on the car he used at Goodwood. He had lapped in 1 min. 52.8 sec., which was 1 sec. slower than achieved by Jim Clark during the race last year, but the monocoque B.R.M. still looked to be in trouble with handling and the pole position seemed to be gained mainly because everyone else was in trouble.